Generally cloudy. High 77F. Winds S at 5 to 10 mph..
Robbie McKelvy, a De Queen resident, received the UA Cossatot Foundation Philanthropic Spirit Award from UA Cossatot Coordinator of Development Dustin Roberts. 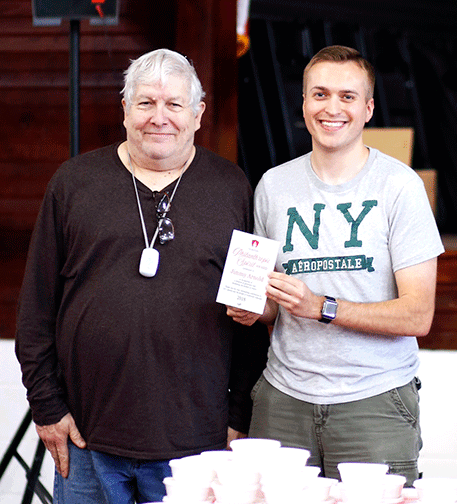 Jimmy Arnold, a De Queen resident, received the UA Cossatot Foundation Philanthropic Spirit Award from UA Cossatot Coordinator of Development Dustin Roberts. The University of Arkansas Cossatot Foundation recognizes UA Cossatot employees Jimmy Arnold and Robbie McKelvy with the Philanthropic Spirit Award during the college’s annual end of year party. 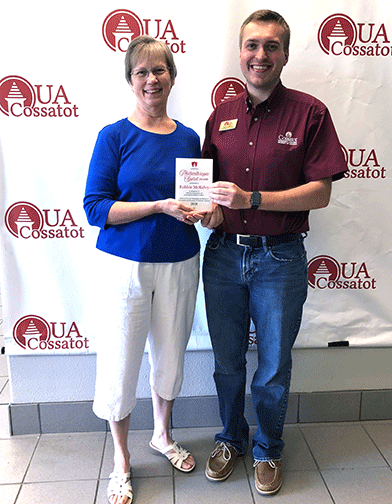 The Philanthropic Spirit Award is established by the UA Cossatot Foundation to honor UAC employees that exude a lifestyle of generosity and promote the welfare of others. Arnold, a resident of De Queen, Arkansas, and UA Cossatot History Instructor, makes and donates afghan blankets to various fundraising efforts for the foundation. Arnold and his wife, Mrs. Jen, also readily open their home to foreign exchange students. The couple is also a vital part of their church. McKelvy, a resident of De Queen and recently retired UA Cossatot Math Instructor, makes and donates UA Cossatot t-shirt quilts for foundation fundraising events. McKelvy and her husband, Billy Ray, also have a scholarship established with the UA Cossatot Foundation for education majors. McKelvy served as UA Cossatot’s team captain for Relay for Life. She is also a contributing member of her church.